Shimla: Himachal Pradesh has made credible progress in adhering to the macro-economic parameters, however, Debt to GSDP ratio which is unacceptably high at 38% is an area of continuing concern, said Chairman of Finance Commission N.K.Singh at a press conference in Shimla today. Nonetheless, he appreciated state govt’s efforts to bring it down form an unusually high debt level in past few years. State govt is conscious of it and would do suitable amendments in its FRBM Act for further fiscal consolidation. Hydroelectric potential is a major source of revenue for the state but its full potential could not be realised due to the fact that Government of India does not recognise hydel projects beyond a certain threshold as renewable energy projects. Commission feels that hydel is a great source of renewable energy. This policy approach needs reconsideration in the broader context of having rich hydel potential of Himachal Pradesh and other similar states. No doubt, if agreed, it would be significant source of revenue generation for the state and ameliorate their debt burden, said Shri Singh. 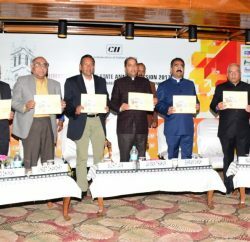 Connectivity is another pillar to unlock the economic potential of Himachal Pradesh specially the huge potential in tourism sector needs vigorous push for road, rail and air connectivity alongwith other infrastructure development, he added. Commission recognizes that problem of hill states and NE states need a somewhat innovative approach for meeting its developmental needs. Himachal Pradesh is lagging in GST collections and the present numbers need to be boosted due to various policy level decisions. 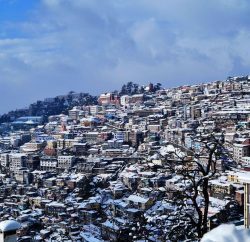 Himachal Pradesh needs to find innovative ways to increase the tax base and the collection. However, Singh acknowledged that there are issues with GST like rates and the compensation which may take some time to settle. Commission will try to make realistic GST projections for states from 2020-2025 considering that 14% compensation will not be there for states in the last three years of award period of this commission. It will also be a challenge to make revenue projections from GST for centre. The finance commission acknowledged a great economic potential of the state and also accepted its vulnerability to disasters. Commission assured to incorporate international experience in funding pattern for mitigation and adaptation efforts. Commission has also conducted a study on Disaster Management which will consider the issues specific to Himachal. 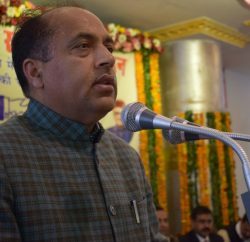 Chief Minister Jairam Thakur highlighted the historical perspective about the statehood of the State which shows the low economic potential. He apprised the Commission about the rural nature of the economy, cost disabilities and difficult geographical conditions of the state. 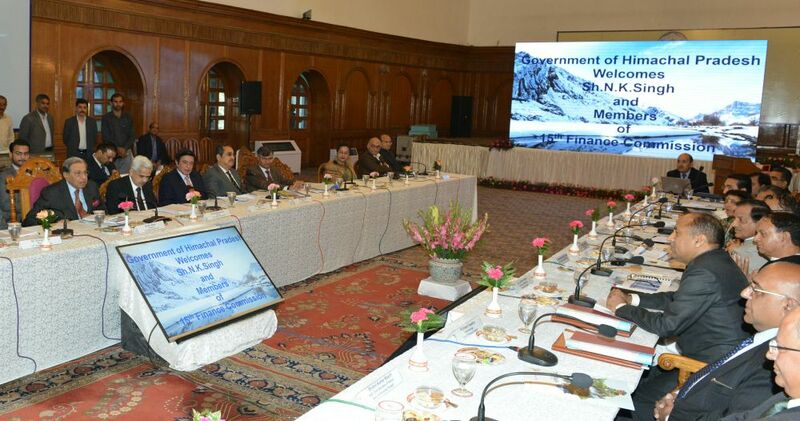 He urged the Commission to make a realistic assessment of the revenues and provide a post devolution Revenue Deficit grant as Himachal Pradesh historically has been a chronically revenue deficit state. He stated that state is incurring annual losses of around 3000 crores due to abolition of Planning Commission. State Govt officials apprised the commission about the cost disabilities arising due to service provision on hilly areas and conservation of forest area. The State demanded 800 crore for SDRF which is required due to its proneness to disasters. They emphasised on the need for mitigation funding. They proposed to include Fiscal Capacity distance and state’s performance on National Priorities as criteria for devolution. They made some state specific proposals like connectivity and infrastructure projects specially rail and air connectivity projects to boost tourism and Rs. 11684 crore for forest management. State mentioned that in view of low credit deposit ration in hill/NE states, 30% of shareable pool of taxes may be set aside for NE/Hilly states. 15th Finance Commission which is on a 3 day visit to Himachal Pradesh also sought views of the representatives from various political parties, local bodies and trade and industry. Industrial package on the line of north east States was demanded in these meetings. In the meeting with representatives of Local Bodies some policy related issues like the modalities of fund transfer to the local bodies were the main focus area. Municipalities urged the commission to consider the flux of tourists and tough climatic conditions for grants and devolution of funds. Representatives also focused on the need for the funds to be given to the Zila Parishads and Panchayat Samitis. They also demanded to consider a change the funding pattern for Smart City Projects with 90:10 ratio for Himachal.